Is it still Friday? I’m sneaking my post in just under the wire… I have an excuse. I just got home last night from a two-week vacation in Southern California and spent the day doing the things you do when you get home from a trip: collecting the mail, laundry, grocery shopping, etc. I didn’t make this week’s French Fridays dish before I left, and when I woke up this morning, the cupboard was bare. It’s a good thing that this week’s selection, guacamole with tomatoes and bell peppers, was a cinch to put together. 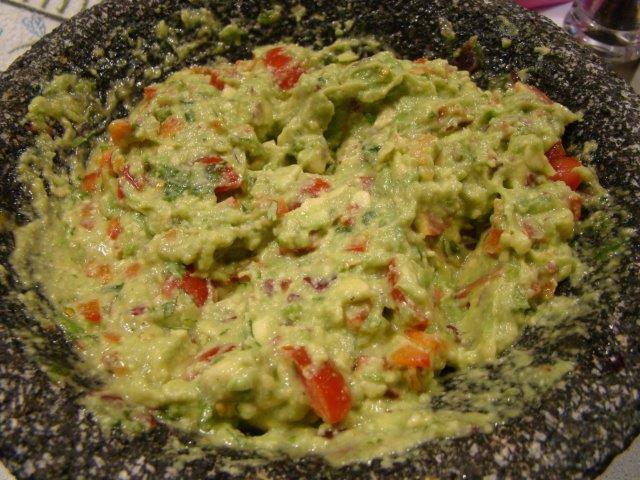 Dorie says that the French are crazy about guacamole, though they seldom make it themselves. I can share their passion. It is so easy to make, though, that I’m not sure I’d be buying it already prepared. Guacamole is a staple on the snack/appetizer rotation at my house. We make several different variations. The simplest is an avocado mashed up with a few generous spoonfuls of salsa. We are also partial to mango guacamole when Ataulfo mangoes are in season. 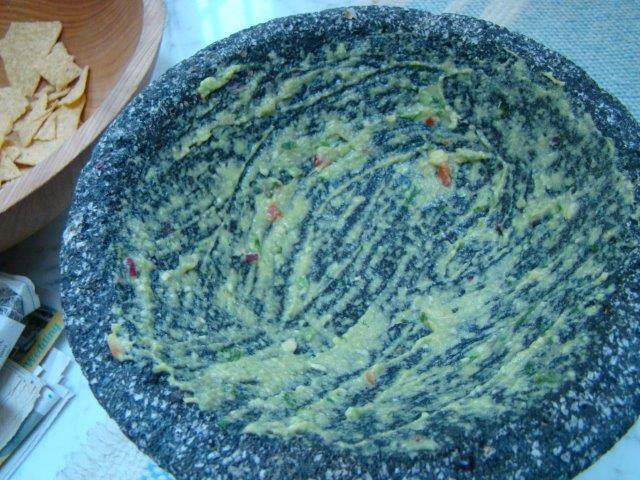 A couple of years ago, Howard got a molcajete, which makes a gorgeous presentation when making guacamole from scratch (i.e. no jarred salsa). The guacamole that Dorie makes in her French kitchen uses all the expected ingredients: avocado, lime, red onion, jalapeno, cilantro, and tomatoes. The surprise additions are the lime zest, diced red pepper, and a splash of hot sauce. Dorie also offers two texture options: smooth or chunky. Our usual guac is chunky, so I wanted to try out smooth for a change. The smooth version is made with a mortar and pestle, but I pulled out the molcajete. By the way, I used just one LARGE avocado but didn’t reduce any of the other ingredients. It’s a winner! We both loved the flavor and the texture. As you can see, we ate the whole thing. (It was lunch, not just an appetizer.) Without a doubt, smooth guacamole with tomatoes and bell peppers will now be taking its turn in our guacamole rotation. I want to share a little about my vacation because I’m unlikely to get around to an entire post about it. This was my first trip to Southern California as a tourist. Previously, I’d been for a few business trips in the not very recent past, but was never there long enough to see anything other than the airport, the office, and the hotel. We visited Los Angeles, Santa Barbara, and San Diego. I would describe myself as an intense traveler, not allowing for much downtime. We made the most of our time in new places. Highlights include: Lotusland (near Santa Barbara), a unique and delightful garden created by a very eccentric woman; a vintage car show in Beverly Hills, tours of the Gamble House in Pasadena and Disney Hall in Los Angeles, and the San Diego Zoo. We were fortunate to connect with so many people. We visited with cousins, reconnected with college friends and former co-workers, and had lunch with the SoCal Doristas (sans Trevor). It was the perfect balance of visiting friends and family and taking in the sights and sites. And, now I’m happy to be home. To see what the other Doristas did with their guacamoles, check their links here. To try it yourself, you can find the recipe here or in Dorie Greenspan’s book Around My French Table. Posted on 27 June 2014, in French Fridays with Dorie, Travel and tagged French Fridays with Dorie, guacamole. Bookmark the permalink. 16 Comments. Welcome home, partner. It was fun to keep up with you on Facebook – loved your pictures of the meet-up. Glad that the guys went along also. Had you ever been to the SD Zoo. It’s fantastic, isn’t it. I went 5 or 6 years ago for the first time and spent the day. I am pretty impressed that you were up and at ’em and posted the recipe this week. I agree. It’s delicious. I make guacamole often but this is the easiest recipe I’ve ever used. I made it all in my mortar and used no other dishes. Again, I am glad you are safely home. It was wonderful to see you, again! And, you had a SoCal treat for FFWD this week – how fitting! I hope Howard enjoyed his conference. I still want to make it to Boston some day! Welcome home! Your holiday sounds fab. I am a rather intense traveller too – I like to seize the day. I don’t make guacamole often, though I like it a lot. I am keen on your mango version – yum! Glad you had such a lovely trip. I have made trips to so many places for work where the only things I saw were the airport, the hotel and the industrial sections :-( How awesome was your Dorista lunch ! Your mango guacamole sounds delicious and I like your serving medium. I’m so glad you enjoyed your trip! Nice time to visit SoCal too. Glad you enjoyed the guacamole. I still have never gotten around to buying a molcajete, though I always think I should. I thought this was good, but then again, I like almost every home-made guacamole to be found! Sounds like a very fun trip and how nice to return to a nice easy recipe. Love the pictures of you lovely ladies. One of these days I hope to fit in my own Dorista meet up. So much fun to meet with the other Doristas :) And yes, agree this is a winner! Glad you enjoyed your vacation. You were in my neck of the woods, Venice Beach. I love the idea of mango guacamole. I love mango but sadly my family does not. Welcome home!! Glad you had a great time on your vacation. Love your molcajete…since I have never made guacamole before, I never heard of a molcajete…now I need one!! LOL! I can’t wait to try your mango guacamole…sounds soooo good!! Good to have you back with us!! You sure did make full use of your vacay time! Will give the mango version a try as they are in season over in my corner of the woods! I think I would have liked your smooth guacamole even better. 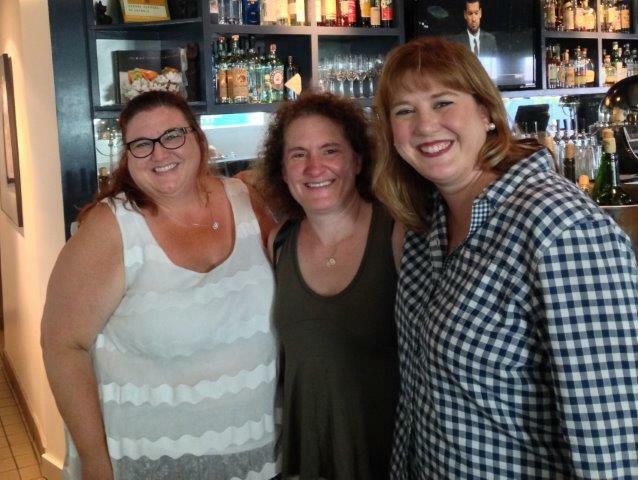 But best of all, I love that you got to hang out with Susan and Christy!!!! looks like a great visit!! your guac looks great, and we’ve done the stirring salsa into avocado mash too!! LOL!! Hi Alice! The preparation before we actually made guac the first time in the molcajete was a pain. He ground rice in it until the rice stopped turning gray (which took a few batches). Then he seasoned it with garlic and cilantro, though that part has probably worn off by now. Overall, it was worth it. I think making and serving guac in the molcajete is an authentic touch. Sounds like a wonderful vacation! So nice that you could meet up with Susan and Christy, too. And I love that you have a molcajete. Sounds like a great trip! We polished off the guacamole too, but for us it was our appetizer! Iit sure was tasty. I was sorry to miss your meet-up when it was so close to me but we were out of town that week. Boo. Hopefully the next time. In the meantime I will be enjoying more guac. As I always do. I just never follow a recipe…just this once. And only for Dorie. I love the texture of yours here. I think it is perfect!